Dubai is often known for its elaborate luxury and engineering feats of man-made wonder. Even one of the largest land reclamation projects in the world, was done in a custom ornate pattern. Ecotourism at first glance is not what most people think of here. However the area has a lot of biodiversity, not just desert but coastal and wetlands also. Dubai and the UAE have started up several large and ambitious projects to help encourage ecotourism and preserve the natural wonders that the region has to offer. Al Maha is the leader in eco-tourism in Dubai. It protects a large area of protected flora and fauna, to ensure that the natural heritage is preserved. A simple resort perhaps, when compared to the rampant development seen elsewhere. The resort’s mission is to keep away such over-development, so all can enjoy the natural beauty of the area. This makes Al Maha not just the largest in Dubai, but the largest conservation area in the whole country. Don’t let the conservation fool you though, this is Dubai after all and though eco-friendly, you can expect a very comfortable and luxurious stay. The Animal Sanctuary and Petting Farm is an experience like no other anywhere else in Dubai. All the animals here, from the exotic to the mundane, are donated, unwanted and rescued animals from all over. The farm encourages people to come and pet, touch; even hold some of, the animals, all the while learning about proper care for that particular creature. Family and schools are very welcome and the farm can easily organize pet parties, as well bring the animals to you. The farm runs totally off donations. So, there is no charge and of course, no offer of help is ever turned away. One of the biggest projects the UAE has set forth is Masdar City, a truly ambitious project to create a whole city that runs, functions, and grows that is carbon neutral and produces zero waste — an eco-neutral city. This inspired city is to develop and invest in clean energy technology, not just for itself, but to help other resorts and sites. The latest in people movers and state of the art cooling technology will be abundant and should ensure it is comfortable and easy to get around, without eating up further energy. Masdar City is host to the Masdar Institute of Science and Technology; an engineering sister school to MIT, the Institute’s main focus will be the development of green technology. Just off the Oud Metha Road, in a small area of the Dubai Creek is nestled a natural wetland area, and with it is the leader in wetland sanctuaries for Dubai, the Ras al Khor Wildlife Sanctuary. Here you can find flamingos, ospreys, marsh harriers, and other wetland birds. 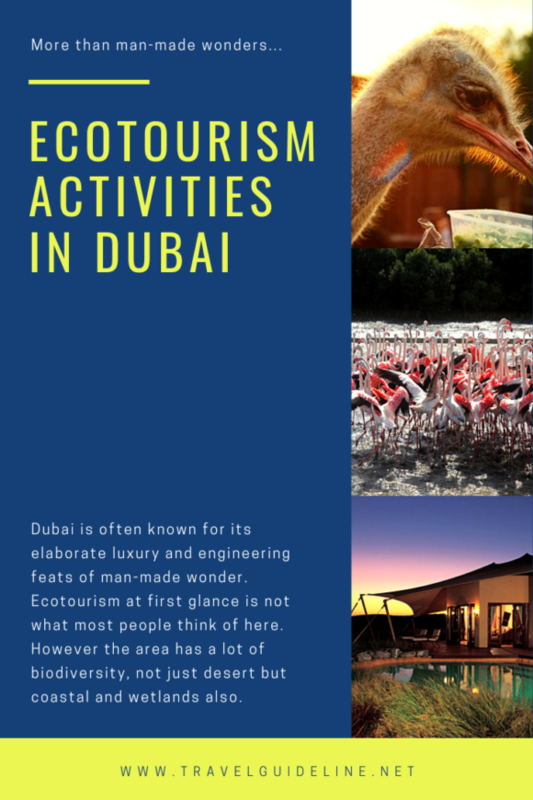 This area is designated as a wetland of international importance and is still planning to do more to help visitors view the natural wildlife of this region, as well as preserve it from the massive land development that Dubai is usually known for. If you want to see and experience the nature of Dubai and not just the glitz and glamour, this preserve is what you have been looking for. Step back from the towering spires, sprawling real estate developments and gigantic shopping malls and take a look at what else Dubai has to offer.